It's fun to picture Lisa Moscatiello as some kind of superhero, toiling by day in the dark recesses of the library where she works during the day, but shedding her glasses to become a nightclub chanteuse after dark. Reality, of course, isn't done with such bright primary colors. (No need to wear a Spandex costume or fight crime, either - which are good things.) 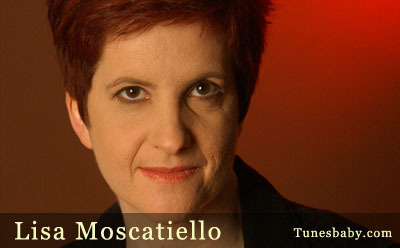 But Moscatiello does possess some powerful skills that have served her well: a sultry and versatile alto, the talent to tackle a wide range of musical styles, and an ability to function without much sleep. Over the past decade, Washington, D.C.-based Moscatiello - who really does have a day job at a library - has built a name for herself as a solo performer and also as part of folk-rockers The New St. George and the Celtic ensemble Whirligig. At the same time, she and former girlfriend Bev Stanton have concocted trip-hop dance tunes as Arthur Loves Plastic, a group popular in electronica circles. Her latest CD, Trouble From The Start, treads new ground with a style she calls 'acid cabaret' - torch songs with multi-layered musicianship and a hint of electronic sheen. Passion and heartbreak stitch together the songs, a mix of covers and tunes from Stanton and Moscatiello. The album's jazzy title track lays out the premise: Love can be 'trouble from the start,' but in Moscatiello's world, it's still a journey worth taking. From the complicated relationship of Ashtray (previously an Arthur Loves Plastic song) to an aching version of You're Crying (originally recorded by Dinah Washington), Moscatiello's expressive voice resonates somewhere deep in your psyche and reminds you of bittersweet relationships gone by. Moscatiello brought together a who's who of Washington-area musicians for the project, a band she dubbed The Space Dots - Erik Wenberg (guitar), Robbie Magruder (drums), Jon Nazdin (upright bass) and Harry Appelman (organ and keyboard). It's a lineup Moscatiello calls an 'experiment' - Wenberg (an indie rocker with the band Emmet Swimming) and Magruder (longtime drummer for Mary Chapin Carpenter) weren't known for jazz recordings, and the musicians had never played together before. But it all jelled well in the end, providing solid backup on every song, and sometimes reaching exquisite heights of their own (such as the extended jam at the end of the beautiful What Happens After Love?). Appelman, a two-time finalist for the Thelonious Monk Jazz Piano Competition, proves especially nimble as the best argument for restoring the organ to its rightful place in popular music. Also appearing on the album are Moscatiello's frequent duo partner, cellist Fred Leider and classical guitarist Phil Mathieu. The ever-humble Moscatiello, who eschews the image of the lone-wolf singer/songwriter, is happy to give credit to Stanton and producer Marco Delmar for Trouble's success. 'I don't ever have this great vision - I always find things by hunt-and-peck,' she said. 'I was starting to get into (a) rut, and I brought Marco a couple of different cassettes with ideas. He could have just taken my money, but he sent those back and said, 'No, I'm not really feeling it.' His idea was that the songs that Bev and I had written had the most uniqueness or charm or something different to them. Last month, Trouble From The Start earned Moscatiello four trophies at the Washington Area Music Awards, including album of the year. (Her awards shelf must be getting crowded - she's won more than 20 'Wammies' over the years.) Even so, as a woman capable of so many types of music, she's sometimes unsure how to draw people to her shows. It doesn't take a marketing genius to arrive at the answer: With a voice and talent like Moscatiello's, listeners have no trouble falling in love.